30 wedding videos equates to a minimum of 1200 hours of edit time. That’s about 8 solid weeks, just to edit the main videos. That doesn’t include general admin, emails, procrastinating Facebook time, or hours lost banging and swearing when things don’t work right. With the edit station being such a big part of my life, you’d think I might have put some thought into creating the space, and making it a pleasurable place to work. And if you did, you’d be giving me too much credit as an adult human being. My ‘office’ (or the spare room, to everybody else) looked like it was a cleaner version of a student hovel. Posters on the walls, thousands of DVDs, and – crucially – the cheapest desk I could find, when I started the business. £20 from Asda (marked down from £40, to be fair! ), barely wide enough for my iMac 27’. And with a printer (and my accumulated junk) hidden underneath, there was no leg space of any kind. 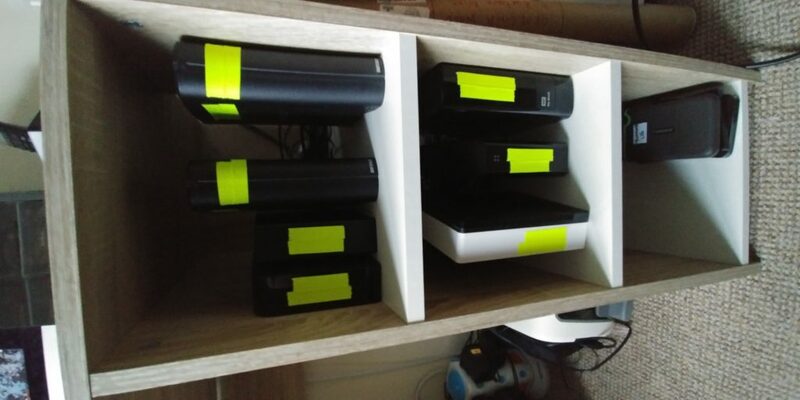 20tb of storage, across 9 drives, was stuffed in one little cubby-space, when they turned on, it vibrated the little desk like a chinook helicopter! Created in the business’ early days, as frugally as possible, it had outgrown it’s original scope. In short, it was not a nice place to work. I never realised this of course – it was, after all, my space. While I might happily spend £1500 on a fancy new drone, £400 on a diskspace never felt justified. So my wife decided to surprise me – making my edit space a pleasurable place to work (and not feel like an edit prison for a dwarf). Wedding Film Edit Station Mk2…In All Its Glory! So, my wife arranged for a friend to insist upon having lunch and watching Star Wars: The Last Jedi the day before my birthday. Giving her, and her crack team a chance to untangle 5 years of hidden messiness. Over 5 hours (yes, 5 hours – I actually feel quite guilty), here’s what they did! New Desk – Hurrah!!! Honestly, I can’t explain how much nicer this is. 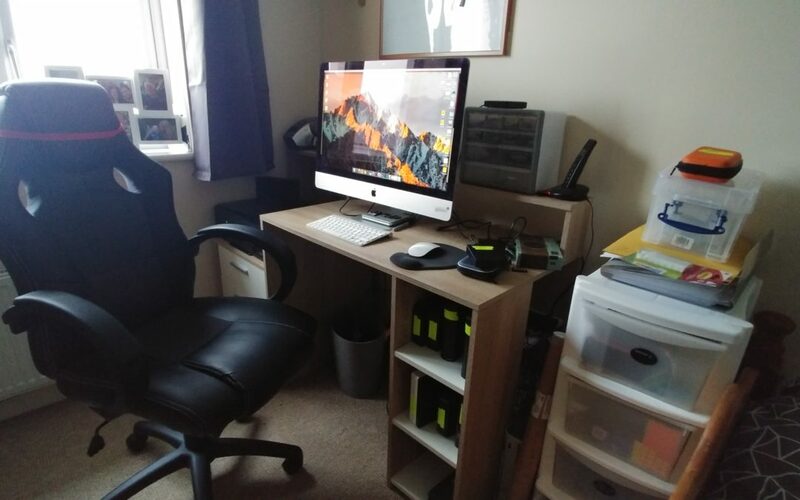 A larger space overall, with dedicated area for a printer, much more leg space, and a series of mini-shelves for the hard drives. .
New Chair – The importance of this cannot be understated. The chair I had was salvaged from my parents in law when they moved house. It was functional, but far from comfy, with no lumbar or arm support. Slouching was key! The new chair is wider, comfier and firmer. It promotes a healthier posture, so hopefully I won’t have shrunk to 5’5 when I’m shooting weddings in 2030! 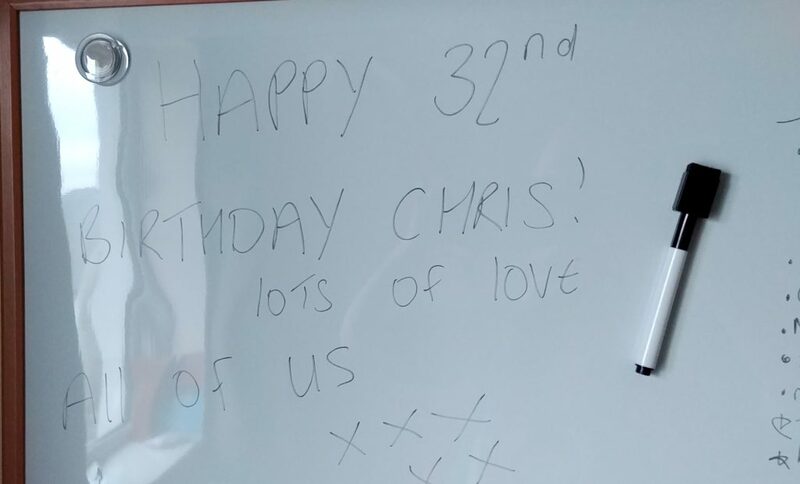 Whiteboard – I am forgetful. And use to-do lists to stay on track. This is much better than my previous ‘scrap of paper and a sharpie’ system. Desk Organisers – I am messy, and a little bit of a hoarder. Subsequently, my tiny diskspace would be filled with pens, receipts, sweet wrappers, usb sticks and general wiring almost immediately after a tidy up. Now I am cured slightly better at keeping the area sparse! Geeky Movie Prints – Before the business (and baby!) movies were a major part of my life. I did a film degree for a reason! Replacing the posters with much more adult (and way cooler) prints, my wife managed to personalise the space, while making sure it looked like a room for a man in his 30s. Getting AMAZING Wedding Video Footage – SPARKLERS!!! Travelling from London to Cornwall for your Wedding?